Thin pizza crust with garlic butter and the best mozzarella cheese around. Served with warm homemade from scratch pizza sauce on the side. Our soft, homemade Italian bread, coated with garlic butter and piled high with mozzarella cheese. Served with warm pizza sauce on the side. Straight from Buffalo, New York! World famous La Nova wings and drummies are coated with Italian herbs, served with celery sticks and Parmesan dressing. Our wings are oven baked, which takes a bit longer. 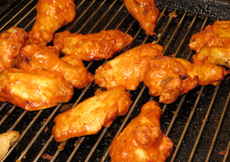 World famous La Nova wings and drummies tossed in a secret hot sauce and oven baked. Served with celery sticks and bleu cheese dressing. Our wings are oven baked, which takes a bit longer.